If you are in need of an immediate solution to fill a leadership position, interim placement is the solution for your healthcare organization needs. At CTL we understand some healthcare positions have to be filled sooner rather than later. The short-term solution of an interim leader will ensure that all current and ongoing goals are met and maintained. A candidate’s immediate contribution will provide stability to a department or area during a time of uncertainty and vulnerability. Therefore, interim leadership provides an organization with an efficient transition between leaders in the best possible manner. 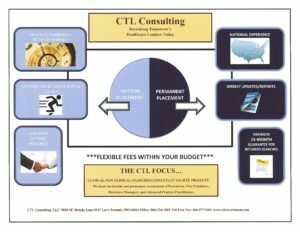 By working with CTL, you will receive the highest-quality outcomes. Once we fully understand your interim leadership needs, we will present the best candidates that correspond to your requirements. We will screen, qualify, and ensure that the interim leader will meet your organization’s goals. Throughout the leader’s tenure, we will stay in close contact with the professional and the Client to ensure that expectations are being met.